A week ago today I left my work as Asha’s PA and Skatefresh’s go to woman for everything admin related as I was moving to Hanoi. During the handover I stumbled across a curious piece of information about the below video of Asha skating in Vondelpark: 5th in line of countries in which watching her backwards skating was Vietnam, right behind Spain. 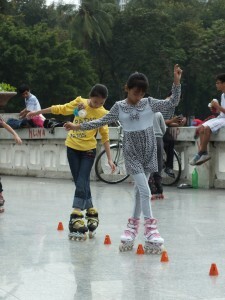 Slightly surprised I decided to search for these inline skaters after arriving in Hanoi. Turns out I did not have to look hard and finding some Vietnamese on wheels coincided with finding my way around the capital. 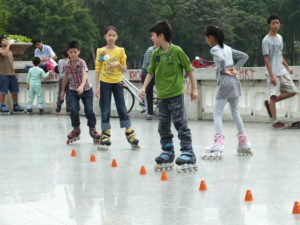 It seems that a number of them practice their slalom skills, side surfs and one-legged glides in the central Lenin Park surrounding the Ho Bay Mau lake. Felt just like Hyde Park, they are rolling around next to a Boathouse. Feeling right at home I took some pictures of the kids on wheels and started missing my own skates. 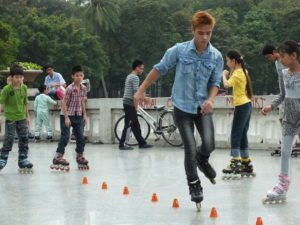 Especially because it would have added the significant tool to show some of these ambitious skaters some bending knee action without knowing what “scissor position” means in Vietnamese. And I so desperately wanted to show them, as even though I was never a skate instructor, having worked for and with them has left me with knowing the most basic facts about teaching people to roll. And here where three siblings, overtaking me on my leisurely stroll, skating backwards, performing T-Stops and lemoning away, but all with straight knees, no scissor to assist them over bumps in the tarmac and the occasional landing on their skinny bums. So I tried with pointing and questionable charade action. It was comical but worked. Giggling the three of them tentatively started bending their knees and rolling with one skate slightly further ahead then the other. Now I am not sure if they did this to entertain this looney foreigner in trainers or if they gathered that I knew what I was babbling about. But if they practice they might just get it and hopefully discover and pass on some skating wisdom. 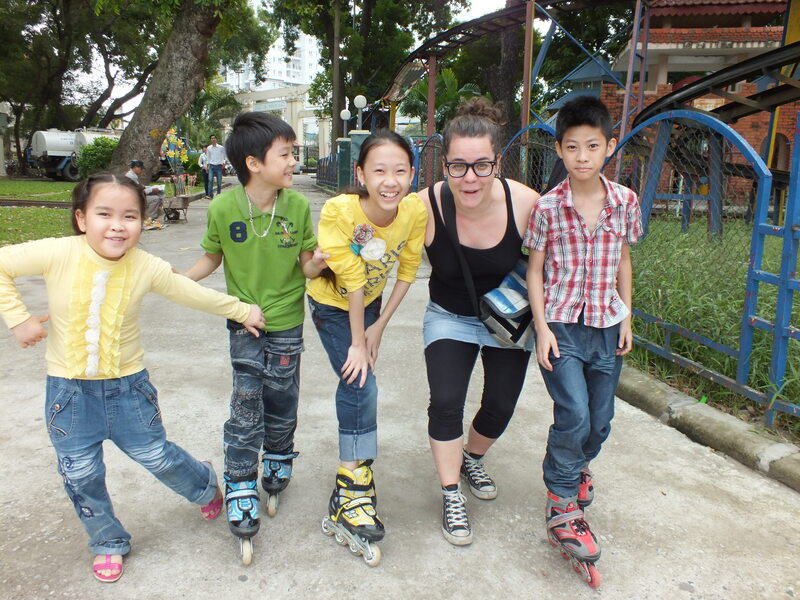 As for me I might just have to get a pair of skates and practice my Vietnamese in exchange for teaching the skaters of Hanoi how to scissor properly. I will also continue posting about inline skate events and interesting skaters in the city. And who knows perhaps one day Skatefresh’s international skate trip might just bring some London inline skaters to Southeastasia.